The PGX Digital SM58 Vocal Wireless System from Shure adds the clarity of 24-bit digital audio to the legacy of trusted Shure microphone options for wireless performance. This system includes the legendary SM58, an industry-standard, highly versatile cardioid dynamic vocal microphone, tailored to deliver warm and clear vocal reproduction under extreme conditions. "A product with excellent sound quality, craftmenship and reliability." Sound: This is an excellent product. Amazing full-strength sound quality. It responds perfectly well within all venues, indoors or outdoors. Signal strength is perfect. Feature: Pro about all features. No complaints. Ease of Use: Excellent sound quality within all applications. Quality: Built very well which can last extensively a long time. Very reliable in all music and voice applications. Value: It is not inexpensive, but worth it because of it's reliability. Manufacturer Support: I have not contacted support for anything on this product. The Wow Factor: I rate this product at the top due to it's sound quality and reliability. Overall: Very satisfied and will replace it with the same product. 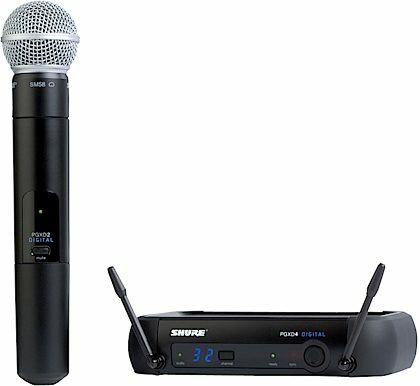 "Shure Quality IN a modern wireless"
Overall: I finally got to use this yesterday in a medium sized venue and I have to say, If you where to compare this wireless with an SM-58 corded, you wouldn't be able to tell the difference, I had 4 monitor speakers in front of me, full front set up and subs, and not even a little feedback. The wireless is sturdy easy to maintain, switching to mute is as simple as turning it on, one button, no dip switches. worth every penny and it comes with a fairly good case that fits well on a rack shelf, this is 100% shure quality and a great medium priced unit, that is every bit professional grade.